Animated GIF's have been trending around the mainstream world wide web in the past year with simpler, more automated tools for the average human to create with. However, artistic phenomenon species such as the talented Mr. Div, have been skillfully crafting works of digital abstracts for years now. Mr. Div, aka Matthew DiVito, is a musician, motion graphics designer and aspiring game developer from Boston, Massachusetts. His GIF designs truly grab your attention quickly and hold your gaze for a mesmerizing moment or two... or three... I cant seem to peel my sight from these seemingly simple, yet complex designs. "There's an aspiration there for a kind of very sharp,very PURE image quality, while people like me want to make things more soft and rough." Matthew's artwork combines repetitive motion and dimension with incredible patterns and gradient palettes. I can only imagine how cool it would be to see some COLOURlovers patterns and palettes animated! See more of Matthew DiVito's work here on his CargoCollective website or his Tumblr site. So what is a GIF? Formally called a Graphics Interchange Format, it is a bitmap image format that was introduced by CompuServe in 1987 and caught trend for it's wide support and portability on the world wide web. Directly Sourced: Wikipedia.org - "GIF"
Scandinavian design trends have brought on popular demand for folk art in many forms. The attraction in contemporary folk art might relate to the sentimental value with connections to generations past, although folk art was never actually considered a particular art form. Antique folk art was considered more a part of cultural trends in ordinary life, sharing community values and expressing lifestyle much like tribal art. An art form mostly based on cultural geography that continues to morph through modern day trends. While it was never considered a movement in art, it certainly contributed to inspiration and influence for certain artists throughout history. 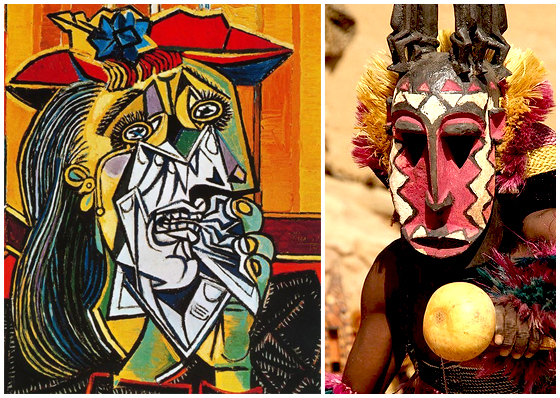 Pablo Picasso for instance, was influenced by African tribal sculptures and masks. Folk art has certainly gained a new spin and style by many modern illustrative artists. While many of these artists still seem fairly culturally bound by heritage, it again is not limited culturally and has spread to some degree to many more spaces of the world. The folk styling is much derived from personal tutelage and a portrayal of many different illustrative translations in art. Styles like Ashley Percival, certainly portray an inkling of modern mixed with historic and geographic-culteral styles. 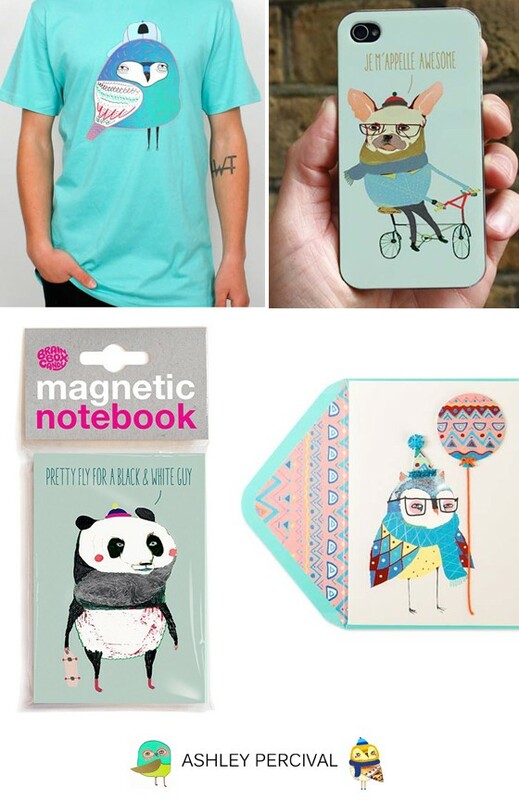 While artwork amongst his Etsy Shop is largely centered around children's artwork prints, his colorful, unique creations can be seen on clothing, home-ware, decor, stationery, cards, and album covers. Ashley's client list certainly boasts that there is most certainly a place in this world for traditional art in modern product design showing that consumers today value it enough for it to become vastly corporate. Recognizable brands such as Ikea, Urban Outfitters and Forever21 certainly speak volumes for what consumers desire in contemporary folk art designs. 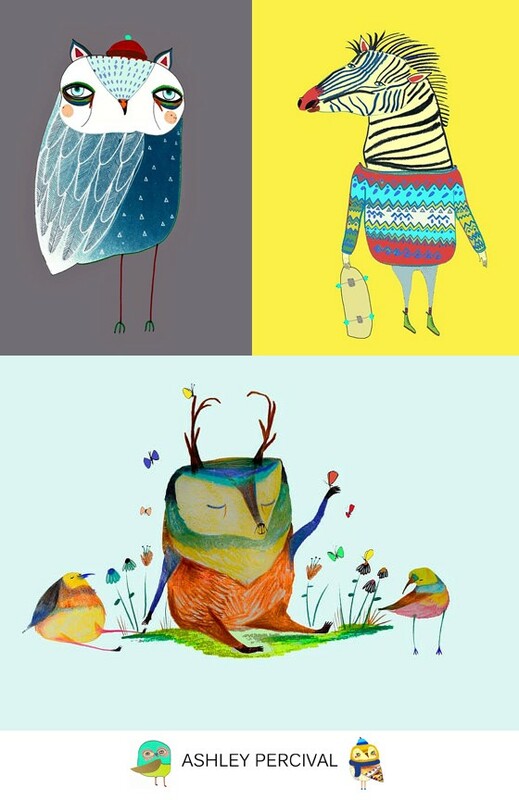 Ashley Percival is from the UK and has been a freelance illustrator, working professionally since 2010. Helen Dardik is another fascinating folk artist! The shapes, the patterns and style cease to amaze me. I have always seen Folk Art to be such a vintage trend based on things my mom had held on to from her childhood. My earliest, most distinct memory of loving Folk Art is a set of vintage Old Maid cards that were hers when she was a little girl. Ashley Percival and Helen Dardik both remind me so distinctly of those playing cards. Do you have a favorite modern or vintage folk artist? Recently, Aaron Epstein, Co-founder of COLOURlovers.com was engaged in an exceptional interview on Mixergy.com. Mixergy is a site that shares the wisdom and talents of founders from a multitude of industries. In the interview, you'll learn how Aaron’s ColorSchemer software helped introduce him to Bubs and Chris and how their collective talents collaborated to develop our beautiful community. Here’s a great opportunity to hear the history of how COLOURlovers came to be! I'm about the same age as Aaron, so personally it was kind of fun to listen to his historic timeline of events from his Y Combinator days through his ColorSchemer days and then eventually meeting up with Darius (aka Bubs) and Chris who had started COLOURlovers in 2005. Thanks again to these guys so invested in bringing a resources of color to the online world. 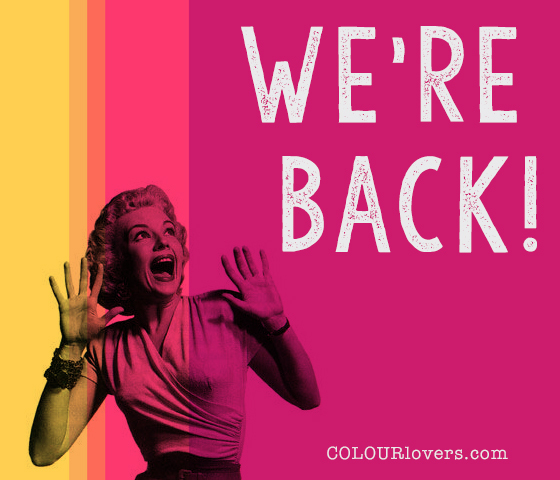 When did you join COLOURlovers? The Steampunk Trend has been building such momentum for some time now. This vintage-modern abstract style garners the marriage between beautiful and sleek with a mechanical-industrial flare, bordering at times on "trashy" if done wrong. It's a style of opposites meshing to make a fantastical smash to fashion. I am so drawn to this ultra creative Steampunk trend, yet I'm not sure what to do with it in my every day life. I want it, but how? As a photographer and creative in general, I find myself meandering (ahem, wasting time) perusing all the steampunk crazed Pinterest boards dreaming up excuses to bring some Steampunk in to my life. What I love about this fun trend is that you can incorporate it in to anything! Visually it's super appealing, so applying it to some of your home decor is easy and simple and is almost an edgy version of "rustic" trends. Jewelry is easy to incorporate in to your every day style. And if you're really looking to make an impression host a Gatsby themed party. I am loving the beautiful dresses adorned in metals for weddings completely decked out in steampunk. Steampunk takes on a modern twist to historic trends, like the medieval age collided with an industrial era. Do you love this trend? Is it too gimmicky for you? COLOURlovers has been a beautiful international creative clique since its conception in 2008. During its first years, the community thrived as a small island atmosphere; everyone knew everyone at this down-to-earth "local artists cafe." As COLOURlovers was presented to the outside world, it grew by leaps and bounds, and as more people were introduced to this colorful experience, being the community that you are, you opened your arms and welcomed the community’s growth. I hike through the mountains of colorful palettes and get lost in the maze of intricate patterns, I see the beauty of these well loved creations synchronized in the gardens of our community, it makes me glow with pride that there are so many who create simply to create. 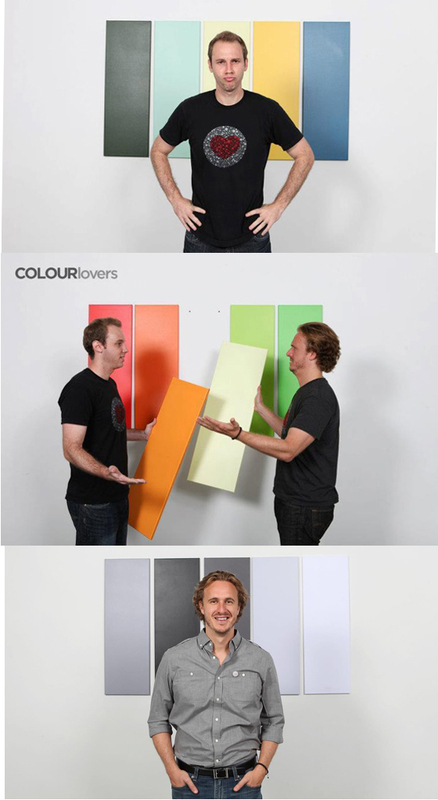 COLOURlovers has always been a place of selfless design. This alone makes me thrilled to announce that we're back! 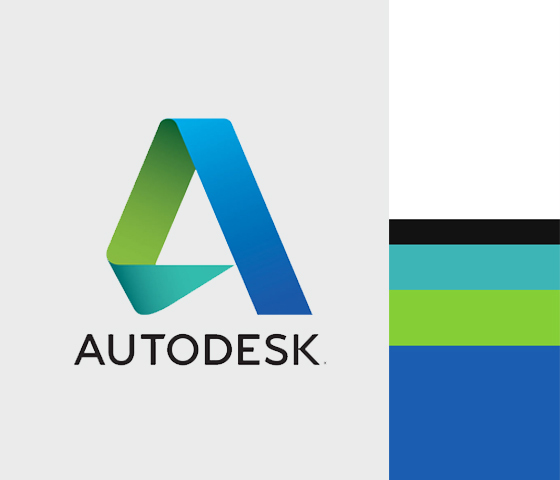 As most of you may know, in February of 2014, Autodesk welcomed COLOURlovers, along with our crafty little sister, Creative Market, into their fantastic creative family. Autodesk boasts a plethora of professional arts and engineering apps; the two that speak loudest to my creative addictions are Pixlr and Sketchbook. Personally, two of my most proficient skill sets are traditional art and photography. This puts us in a fantastic position to gain more avenues of personal artistic growth! 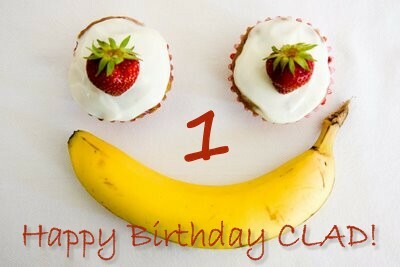 Celebrating Community ~ CLAD Turns One! Today we celebrate the first birthday of the all-popular community-run group, COLOURlovers Artist of the Day, better known as CLAD! CLAD was a user created idea that was user developed, user loved and is currently user managed -- and massively user adored! Since CLAD's inception exactly a year ago, the group has attracted over 400 members, spawned more than 18,500 patterns and created over 2,500 celebratory 1Lover Palettes. Today, the CLAD group founder and administrator, Dawn, AKA COLOURlover, American Women, would like to share and celebrate the COLOURlovers community that is CLAD. Take it away Dawn! 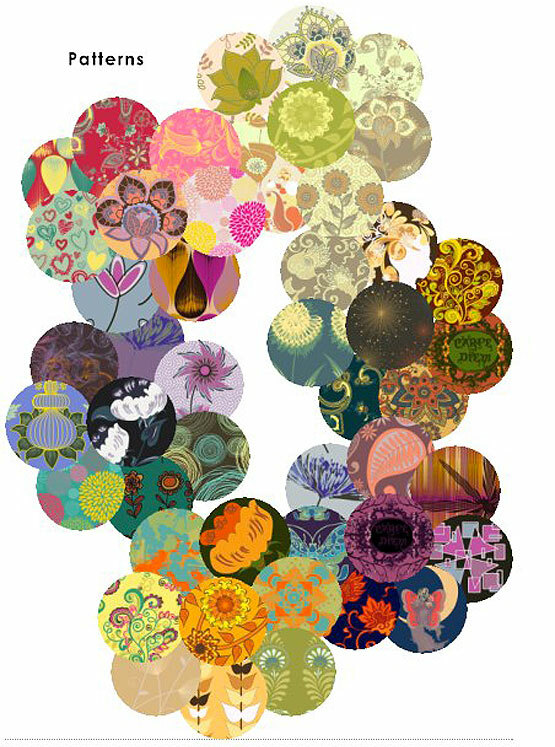 Hello COLOURlovers, my name is Dawn DeSimone-otherwise known on COLOURlovers as American Women. Today is CLAD's 1st Birthday! CLAD was born! Each day we randomly select a COLOURlover from the group as our featured artist and encourage other lovers to visit their profile page, explore and love their art, and then use their palettes, colours and templates to create patterns and 1 Lover Palettes in celebration of their work. We then induct them into the Colour Lovers Colours group, better known as CLCL, where we encourage lovers to name a colour in their honor. At that time, I personally was on my 6th COLOURlovers member identity incarnation and had finally settled on American Women. Ycc2106 was my COLOURlovers idol, friend and now partner in thought crime. She helped take CLAD from forum to group to fun to what it is today. Ycc2106's community efforts are priceless! She is currently on hiatus for "reasons unknown" and with ycc2106 missing the group went on hiatus for a while too... she is deeply missed, yet never forgotten because of people like you who continue the legacy of what CLAD's mission stands for! A lot has happened this month already. This week I am going to keep it short and sweet as we have the holiday weekend ahead. This week I'll cover our last survey and a discussion about doing a tribute project for Sunmeadow's family. Thoughts and opinions needed on both subjects. In looking at the last survey responses, it's fun to see how COLOURlovers use the site in different ways be that from your desktop or laptop or mobile device. We had about a 107 entrants to the survey, double what we've had before - Thanks to everyone who got involved. I will be skipping a survey this week in leu of the Easter weekend and the Moo contest. I will be accepting open suggestions for the next survey which will be based on Groups. Anything and everything Groups related. So suggest away! As a dark cloud shrouded the COLOURlovers community with the sad news that one of our dearest members had passed away, the mass of ways to show our love, life celebrations and tribute to dear Sunmeadow as a wonderful artist and person, have been happening all over the site. It's touching to see everyone surround her passing with such compassion and devotion. Suggestions have been coming my way to put together a physical tribute for her family. The best suggestion came from, Penina of the COLOURlovers on Spoonflower Group - a book (possibly a Blurb-style book). This book would include her works of art on COLOURlovers, but I also thought it might be nice to also include notes of tribute from her fellow community members and closest friends on COLOURlovers as her father had expressed an interest in being able to come back and read through all the wonderful things members had to say about her. The COLOURlovers Team is in support of a project we could gift to her family as a colorful piece of Sunmeadows artistic expression on COLOURlovers.com. Will any other members in addition to Penina, be willing to assist in organizing this project? With over 6,000 palettes, 10,000 colors and close to 800 templates it will be quite the undertaking to filter through what to include and in what order. I am also up for alternate suggestions for a tribute piece. A quilt has crossed my mind, but I think a book would certainly be able to fully encompass all her beautiful works and messages of love and support by members. Thoughts? 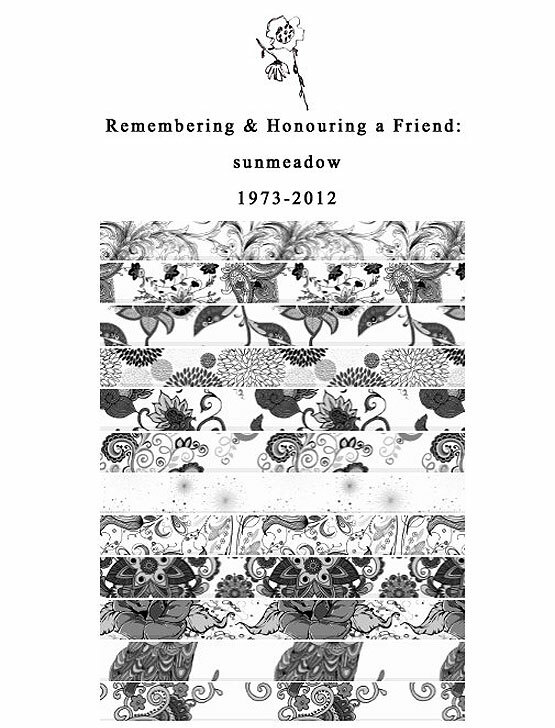 Sunmeadow was such an intensely defined COLOURlover that the reality of her loss was so great to many who knew her well and even to those who did not. Let's give the gift that Sun gave us, to her family to cherish and treasure as well. *Sunmeadows wonderful works of art and account will remain online. A tribute in Artist Palette Challenge (APC) - One of Sun's groups, now administered by WordofMouse. FFP - SUNMEADOW, a tribute in the Freeze Frame Project Group administered by Gasp365. Sunmeadow was honored in the March 2012 Remembrances, in the Remembrance Group administered by ketisse. 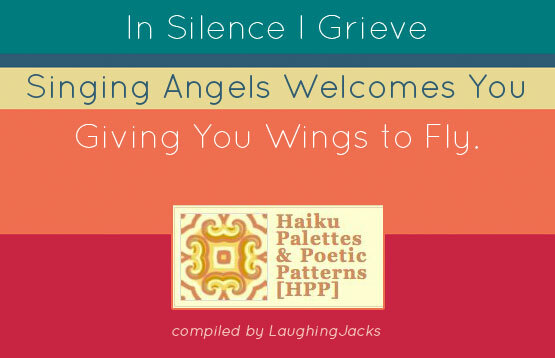 Sunmeadow Memorial HPP in the Haiku Palettes & Poetic Patterns dedicated to the memory of Sunmeadow, also administered by ketisse. Sunmeadow Fields, a tribute section in The Anythings Group administered by American Women. And lastly, a look back at Sunmeadows moment as CLAD (COLOURlovers Artist of the Day Group), also administered by American Women. *Please let me know if I missed any. Spring is hitting some of us big time! Are you feeling the soft pastels or bursting-budding colors? Have you gotten the bug to create even more flowery floral patterns and shapes? I just kinda "sculpted" this using circles, triangles and lines in Seamless Lite. Although she doesn't necessarily recommend this method, because it creates such a large "file" type to do a repeat load from your saved shapes, it's still amazing! I think it's a great example of not limiting yourself with the tools you have at hand. By squishing, bending, mashing, rotating and a good eye, HeringDevotee was able challenge what she had to work with to create a work of sketch-like art. Quite impressive! Speaking of challenges, the CreateMixedMedia Template Challenge came to a close last week with some great submissions. I will Love Note all winners, participants and commenters on April 1st announcing live showcase. Winning templates will be showcased on the homepage during the first week of April (days 1 through 7) over at CreateMixedMedia.com. Another big, congratulations to COLOURlovers OrigamiMei and Pennington for winning the FLOR contest! I am interested in ideas from you guys on how we can run contests where it doesn't feel that the most popular COLOURlover(s) seem to win. I honestly don't feel that either winner won because they might be popular (as they both have attested), but we do see that you may want more attention to how the voting is filtered and submissions displayed on such large-scale contests. You recall a previous contest with Betabrand (lisadale69 and her plaid shirt palette) where a new COLOURlover won (new in that she registered in order to play in the contest), so such is the balance of the matter. I have to admit, both winners are fantastic, active members of our community and are very talented and well deserving - Maybe next weeks survey?! Give me some ideas on how to make voting more fair and/or easier. I see some great suggestions in the FLOR winners post. 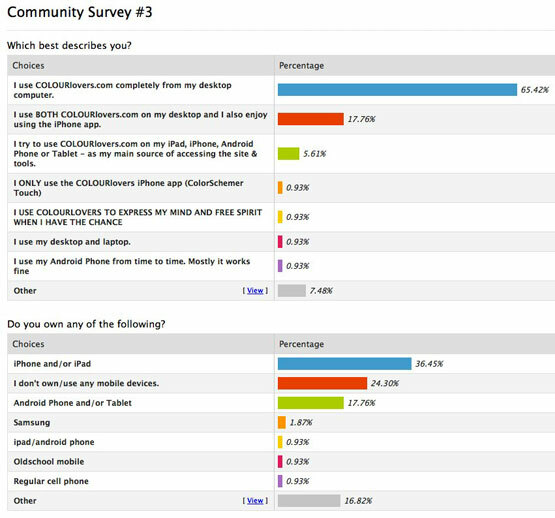 Lastly, our community surveys are getting some nice feedback showing us what you guys feel and think as a majority. The last survey really showed the need for some Seamless Studio (and Seamless Lite) tutorials and a huge interest in those tools. So thank you for the feedback and the extra little comments have also been helpful, I read each and every one. 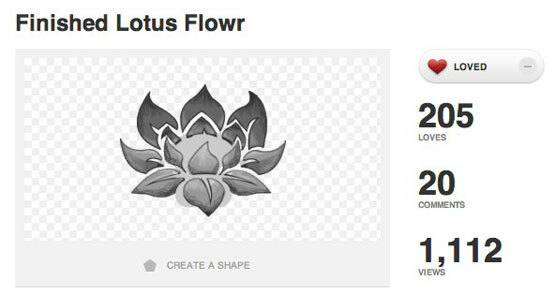 This week I decided to keep it simple and find out how mobile some of you are as I've suddenly received an amount of questions about the COLOURlovers site and using it mobile, both for contests like we recently ran with FLOR and with creating pattern templates using Seamless Lite. Interesting feedback so let's find out how everyone else uses COLOURlovers, I am curious how many of you are trying it out on the iPad, iPhone, Android devices and such. Last weeks T-Shirt winner is NorthShoreShells, COLOURlovin since December 2011. Congratulations and thanks for the survey entry and extra input!